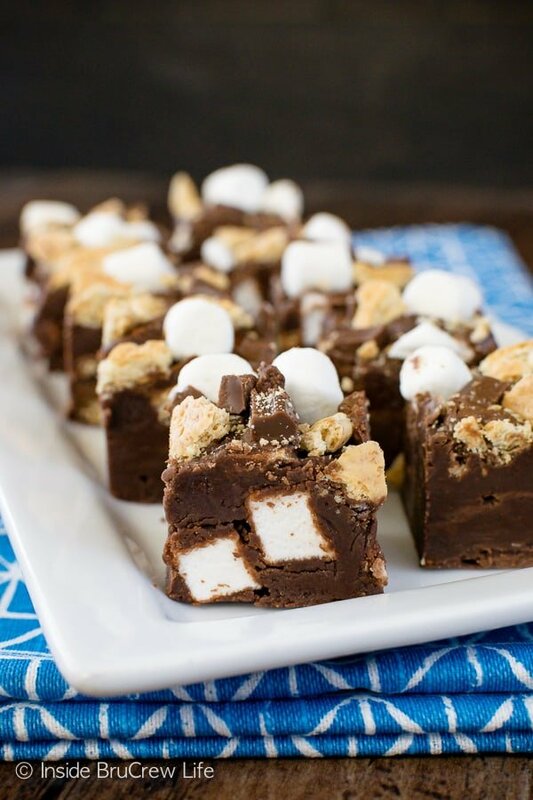 A batch of Milk Chocolate S’mores Fudge is an easy no bake treat to make when you are craving that chocolate and marshmallow combo. 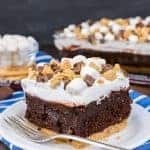 If you enjoy easy s’mores treats made in the comfort of your home, you are going to love this gooey Chocolate S’mores Pudding Cake. We are officially enjoying the lazy days of summer. School is out, and the kids are enjoying lazy mornings sleeping in. That’s probably need to come to an end soon because they are sleeping in super late, and then just bumming the rest of the day. Time to institute some summer chores and must do’s before those electronic devices come out. When summer gets here, all I can think about are s’mores. There is just something amazing about that chocolate, marshmallow, and graham cracker combo. It’s a treat I could enjoy every night. Of course, when there are kids around I just can’t enjoy s’mores. Our boys especially like to create flaming balls of fire with the marshmallows. Then they walk around like Indiana Jones in the Temple of Doom waving the flaming sticks all over the place. They did this as little kids, and they still do it now as older teenagers. 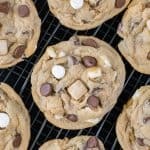 How is someone supposed to sit still and enjoy a gooey s’mores when crazy kids are getting sticky marshmallow on everything, dropping perfectly good chocolate on the ground, and making torches? The answer is you don’t. I have found that the best way to enjoy s’mores is to create fun creations in the kitchen far, far away from a blazing fire. Some of my favorite things so far is this S’mores Popcorn, these S’mores Cookie Cups, and this S’mores Latte. 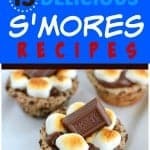 Yummy sweet s’mores without the mess and danger of a fire. Now that’s the way I like it. 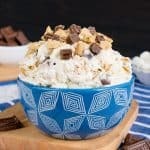 No bake s’mores fudge is a great option for hot summer months when it’s blazing outside, and I don’t want to heat up the inside by turning on the oven. 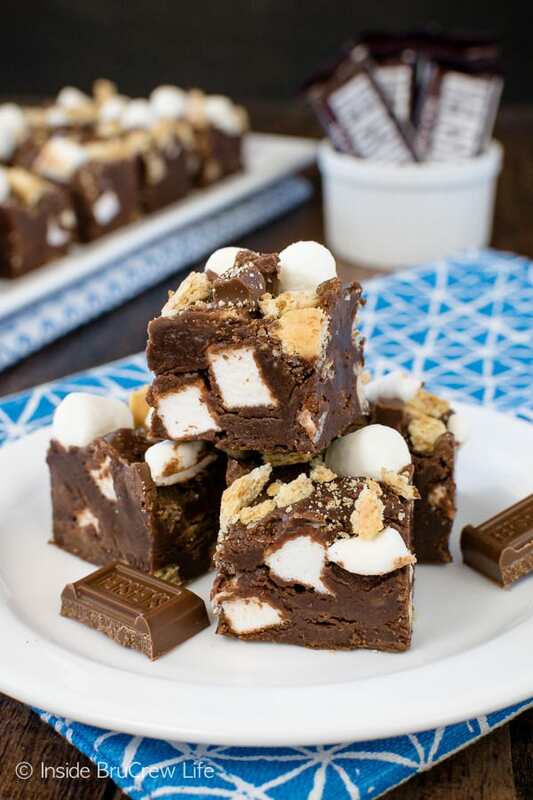 This Milk Chocolate S’mores Fudge is an easy to make and the perfect treat for summer. Well, it’s good any time of year if we are being honest. I’m all for easy fudge every month of the year. 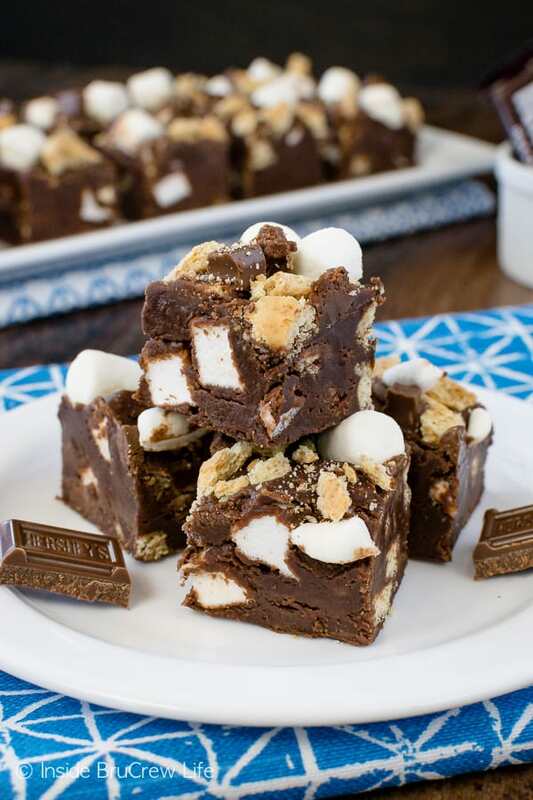 So whether you enjoy your s’mores made over a crackling fire on in the comfort of your kitchen, this easy s’mores fudge recipe is for you. Line an 8×8 pan with foil or foil lined parchment paper. This will allow you to lift the fudge out easily later. 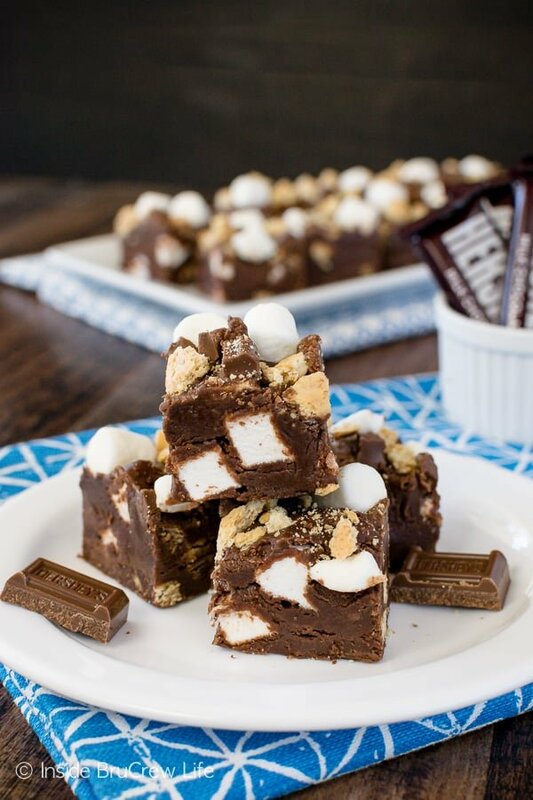 Start by measuring out your marshmallows, chopping your candy bars, and breaking the graham crackers into chunks. Make sure to set aside some of each for the very top of the fudge. Place the milk chocolate chips and butter in a large saucepan over low to medium heat. You do not want a high temperature because your chocolate can scorch easily. Open the can of store bought frosting and microwave it for 30 seconds. Just long enough to melt it slightly, so you can pour it into the melted chocolate. Stir everything together until it is nice and creamy. Remove it from the stove and let it cool for about 10 minutes, stirring occasionally. 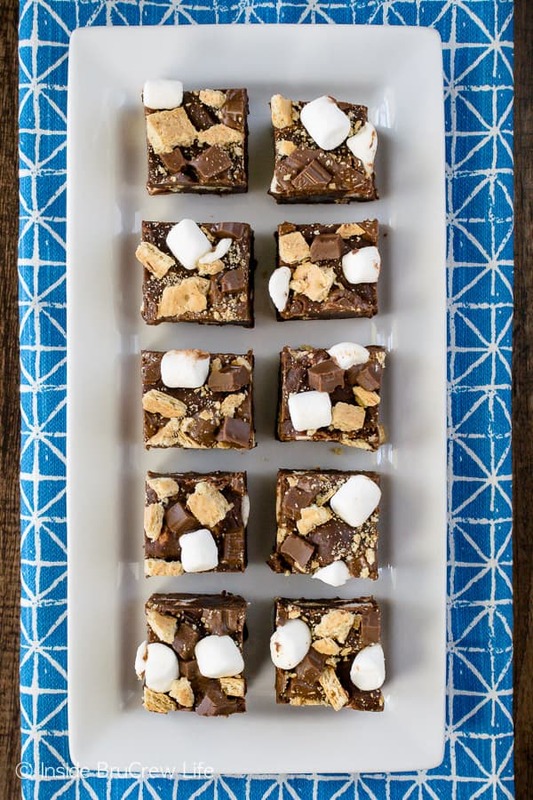 Pour in the marshmallows, graham crackers, and candy bars quickly. Pour it into the prepared pan. Press the extra ingredients into the top of the warm fudge. This is optional, but it really makes the fudge prettier. A No Fail Orange Creamsicle Fudge will add a pretty flair to your summer dessert tables. 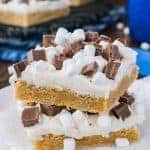 This easy Caramel S’mores Fudge is loaded with marshmallows, graham crackers, and chocolate bars. Buckeye Fudge is what happens when you combine creamy peanut butter fudge with smooth, rich, dark chocolate fudge. This Krispie Treat Fudge is the best of both fudge and gooey marshmallow treats! 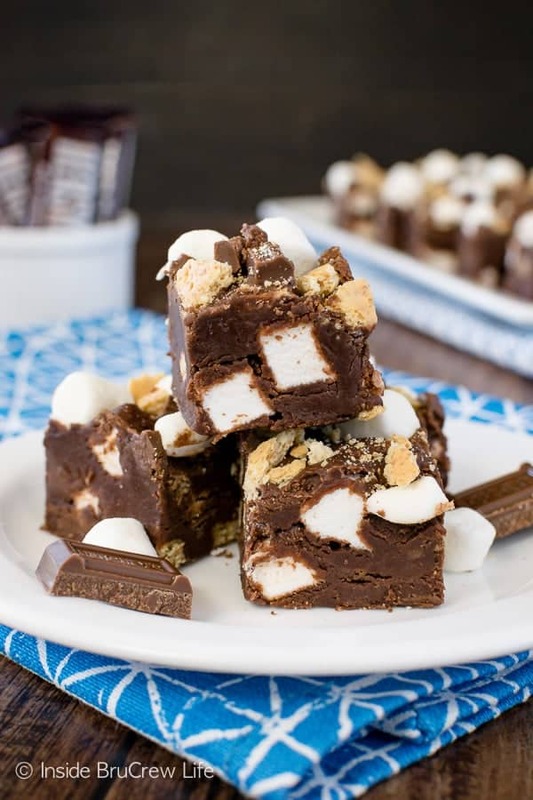 A batch of Milk Chocolate S'mores Fudge is an easy no bake treat to make when you are craving that chocolate and marshmallow combo. 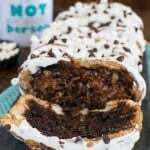 Line an 8x8 pan with foil or foil lined parchment paper. Place the chocolate chips and butter in a large sauce pan. Heat over low to medium heat until melted. Open the frosting and remove the foil seal. Microwave for 30 seconds. Stir and pour into the melted chocolate chips. Stir until the mixture is melted and creamy. Remove the pan from the stove and let cool for about 10 minutes, stirring occasionally. 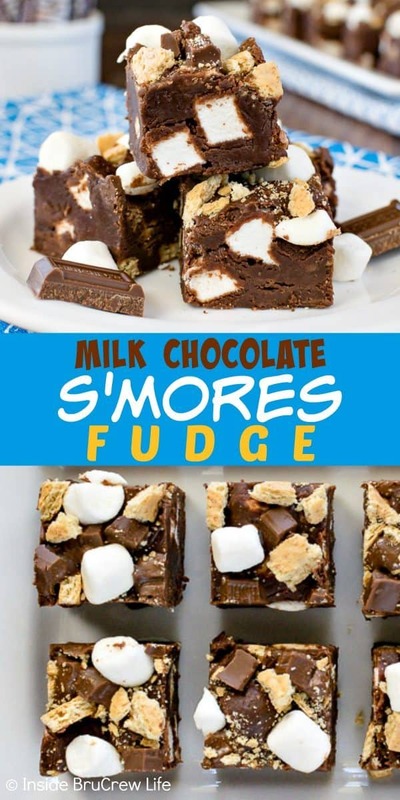 Quickly stir in 1/2 cup marshmallows, 1/2 cup crackers, and 1/2 cup chocolate bars. Pour the mixture into the prepared pan. Press the remaining marshmallows, crackers, and chocolate bars into the top of the warm fudge. Let the fudge cool completely before cutting into squares.